Three months ago Stephan et al. demonstrated carbon dioxide sequestration by FLP chemistry (frustrated Lewis pairs) (previous episode here) and this month Ashley et al. have taken it a step further and report carbon dioxide reduction (DOI), chemistry relevant to the methanol economy . 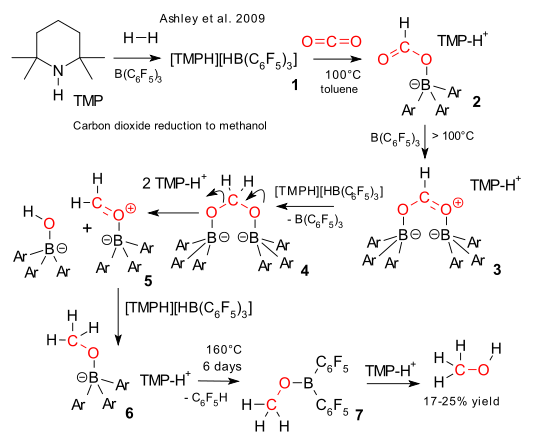 Combine TMP, tris(pentafluorophenyl)boron and hydrogen to form the (TMPH)(HB(C6F5)3) salt (1), splitting the H2 molecule. Next add CO2 to a solution of 1 in toluene at 100°C and the formatoborate (HCOOB(C6F5)3)(TMPH) 2 forms quantitatively. Above 100 °C the reactions are no longer reversible. Attack by free BAr3 forms intermediate 3 which can be reduced by another equivalent of (TMPH)(HB(C6F5)3) salt to 4. This acetal is unstable and a TMP proton induces cleavage to intermediate 5 which is reduced again by (TMPH)(HB(C6F5)3) salt to the CH3OBAr3TMPH complex 6. Unable to dissociate into its constituent parts even at 160°C, a proton attacks one of the aromatic rings splitting of C6F5H and forming CH3OBAr2 + TMP. Finally distillation of the reaction product yields methanol in a 17-25% yield. A catalytic system is in the making.